With his 1893 spring tour cancelled, Joe rested in the home of a wealthy friend in Jamaica Plains near Boston. When he re-emerged professionally, it was as the leading man with the Boston Grand Opera House Company. Whether by accident or design, Joe’s artistic base shifted back to Boston for the next three years. Boston in the 1890’s still rivaled New York City as America’s premiere theater town. It was aptly nicknamed America’s "Athens" while New York was referred to as "Rome". Joe’s work with Boston companies during these years received national press, re-establishing him as a major classical actor and the "successor to Edwin Booth." In June of 1893, Joe triumphed in Rosedale at Boston’s Grand Opera House. It played an extended engagement, and then toured. When the production played Montreal, the same audiences who had hissed him in The Froth of Society now welcomed him back warmly. A New York Grand Opera House engagement was arranged, and Joe’s performance as Elliott Grey was received with multiple curtain calls after each act and a standing ovation at the play’s end. But despite this come-back, Joe resisted offers from New York managements and continued with the Boston Grand Opera Company through the spring of 1894, playing the leads in William A. Mestayer’s Sappho, Edward M. Alfriend’s The Diplomats, and most notably in Hamlet. In September of 1894, Joe played Rosedale at New York’s Star Theatre. This was a significant engagement due to the fact that the play had originally opened at the Star in 1863 for a run of 125 performances. Older audiences remembered Lester Wallack as Elliott Grey and compared the two. But to a new generation, Joe epitomized the role of the "gay, handsome, dashing lieutenant of lancers, who can make love, sing a song, crack a joke, or knock a man down with equal facility." Of this engagement, the New York Recorder wrote: "Mr. Haworth’s Elliott Grey has been seen here before, but his work last night in the part made famous by Lester Wallack, seemed to the admirers of this accomplished actor to have gained in virility and finish, while to the few who were unacquainted with Haworth’s talents, he must have seemed a revelation." January of 1895 saw Joe return to Boston to open a lavish new theatre called the Castle Square. The engagement proved extraordinary for it’s length, ambition, and success. Opening with Hamlet, Joe played through the spring in a repertory that included Rosedale, Richelieu, The Bells, Richard III, and a commissioned blank verse play called Rinaldo. Rinaldo told the story of a young village doctor in the time of Dante, who abandoned his betrothed and traveled to Florence, becoming rich and marrying into aristocracy, only to suffer the remorse of a biting conscience. It was a deeply personal vehicle for Joe that mirrored the years when he felt he had lost his way as an artist. "His Hamlet is one of remarkable value and worth. This much may be stated with absolute certainty. None of the actors who have attempted the role during the past dozen years, before or after Edwin Booth passed away, have at all equaled Mr. Haworth in pleasing effectiveness or in the great essentials of the role. This new Hamlet is not only one of extraordinary merit, but it is builded on lines which will make it popular with the masses. 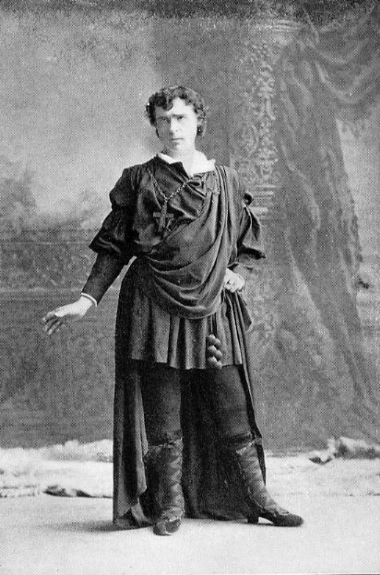 While the memory of Edwin Booth’s acting in this role is fresh in the public mind, no new Hamlet will be accepted without question. But Mr. Haworth’s Hamlet more nearly approaches the American ideal than any other which has been presented. It has qualities which should win for it a permanent place in affectionate public regard. The great merit of this Hamlet lies in the fact that Mr. Haworth has a clear, intelligent conception of the character, and that he presents it consistently and with such clearness of demonstration and illustration, that it is easily understood by the average auditor of fair intelligence. There is a straightforwardness and directness in the actor’s method, as the character unfolds and develops which challenges admiration. "His conception of the character follows closely that made familiar by Edwin Booth, and much of the admirable business of the play used by that distinguished actor is adopted by Mr. Haworth, but there is no attempt to copy the illustrious dead. Indeed, Mr. Haworth does not look unlike Edwin Booth in the robes of the melancholy Dane, and his personality fits the character admirably. He makes at all times a pleasing, impressive, dignified, graceful prince, and fortunate graces of person aid him materially in conquering his audiences at the outset. To the scholarly, intellectual, spiritual, philosophic and poetic qualities of Hamlet, Mr. Haworth gave beautiful expression. He never for a moment lost his firm grip upon the character; never lost sight of his ideal, nor forgot the greater meaning and significance of the ideal which Shakespeare created." It is hard to think of a profession that is more demanding than that of a 19th Century theatrical star. For nine months a year, it was like running as a major party’s presidential nominee. It was like pitching in the major leagues every single night. It was like being a general in the eternal and unrelenting heat of battle. Travel was by train and the best stateroom available was still a challenge. The distance between tour stops was often bridged at night. An exhausted actor or actress would arrive in a city first thing in the morning, check into a hotel, and head to the playhouse to rehearse for the night’s performance. For the leading player, that performance would consist of playing the most physically, vocally and emotionally demanding material in the entire theatrical canon. Joe took his repertory on such a tour. A typical week’s schedule would be: Monday, Richelieu; Tuesday, Hamlet; Wednesday matinee, Rosedale; Wednesday evening, Richelieu; Thursday, Hamlet; Friday, Rosedale; Saturday matinee, Hamlet; Saturday evening, Macbeth. In Joe’s supporting company was young Tyrone Power, Sr., playing de Mauprat in Richelieu, Mathew Leigh in Rosedale, Laertes in Hamlet, and Macduff in Macbeth. In the latter two plays, audiences were thrilled by the athleticism of the stage combat. Power was a superbly agile actor, and Joe was masterful at swordplay. Joe’s efforts to make the combat look dangerous and violent were not without risk. In Boston, he had lost a good part of his right thumb during a performance of Richard III. In September of 1896, Joe returned to the commercial New York theatre, but interestingly he did it almost completely in disguise. The play was Sue by Bret Harte and T. Edgar Pemberton, under the management of Charles Frohman. Adapted from Harte’s story "The Judgment of Bolivas Plain," it told of an innocent young girl living with her selfish brutal father in a mining camp, and of her marriage to a man she didn’t love to escape her surroundings. As the loutish husband, Ira Beasley, Joe buried his matinee idol looks under make up and hair pieces, and played with great comic skill opposite Theodore Roberts as a tippling sheriff. It was an extraordinary risk for a leading man to take, but the production succeeded and Joe’s reputation as a gifted and versatile actor deepened. And despite the disguise, Joe’s inherent romantic endowments made palatable the fact that Annie Russell’s charming and beautiful Sue stayed faithful to her husband at the play’s end. In the December 26, 1896 issue of the New Dramatic Mirror, Harrison Grey Fiske wrote: "In the highest ranks of living American actors the name of Joseph Haworth stands prominent. He has proved himself a player of consummate art in society play, in melodrama, in comedy, in classical roles, and his admirers are innumerable who look upon him as the legitimate successor to Edwin Booth. Eminent critics have frequently compared his work with that of Booth, and the discriminating writers of Boston, to whom Mr. Haworth’s work is more familiar than New Yorkers, have pronounced his Hamlet the best impersonation of the melancholy Dane since that of Booth. Madame Modjeska has pronounced his Macbeth the best she has ever played to, and his characterizations of Richard III, Rinaldo, Matthias, Orlando, Malvolio, Romeo, Iago, Cassius, Icilius, Claudio and other parts of like importance have been of the most impressive merit. His work as the Major in Magda, as Sir Edward in Mary Stuart, Philip Herne, the Man of the World, Armand Duval, Count Phillippe, as well as in Rosedale, and in no end of other roles has been memorable. This season, Joseph Haworth has played Ira Beasley in Sue with great success, and he is said to have in contemplation for next season a starring tour. Meanwhile he is under contract with Al Hayman and Charles Frohman to join Madame Modjeska." In the 1890’s, the three greatest actresses on the world stage were Italy’s Eleanora Duse, France’s Sarah Bernhardt, and Polish born Helena Modjeska who had adopted the United States as her home. In 1896, Joe became Madame Modjeska’s leading man. Joe shared over-the-title billing with Modjeska, and played opposite her in Macbeth, Much Ado About Nothing, As You Like It, Measure for Measure, Camille, Mary Stuart, Magda, and most extraordinarily Hamlet. On some notable evenings, Madame Modjeska starred Joe as the Melancholy Dane while she supported him as Ophelia. Joe’s approach to the work was more spontaneous and experimental than Modjeska’s, and she called him "erratic" at times. But all in all, Modjeska was deeply fond of him and their work together was widely praised. Joe’s three seasons of tours and New York engagements with Modjeska gained him a new level of fame. He became without question the foremost classical leading man on the American stage.